Found in the Upper Cape, the town of Mashpee Massachusetts is home to the Wampanoag Nation, the Native American tribe which met the Pilgrims at Plymouth and joined in the in the first Thanksgiving. Mashpee became home to the Wampanoag (People of the First Light) after the area was created as a reservation for the tribe due to diplacement elsewhere on Cape Cod (the name Mashpee is derived from the native name “Massipee,” which means “great waters’). A pow-wow is held in Mashpee in July of each year to celebrate Wampanoag culture, and the town’s Wampanoag Indian Museum contains a wealth of information about the tribe’s history in the Cape. 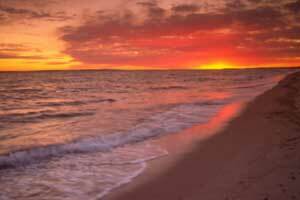 Although Mashpee has several beaches, the only one in town that is open to the public, South Cape Beach, is found in South Cape Beach State Park, located on Vineyard Sound as well as parts of Waquoit Bay, featuring a barrier beach, dunes, salt marsh, woodlands, and kettle ponds. The white sandy beach is over a mile long, and the dune boardwalks allow one to explore the natural beauty of the area without disturbing it. There are plenty of nature conservation areas in the inland parts of the town as well, including John’s Pond Park Conservation Area, Mashpee River Woodlands, South Mashpee Pine Barrens, and Lowell Holly Reservation. Mashpee is home to the beloved Cape Cod Children's Museum and the equally kid-friendly Cupcake Charlie's. It is also home to eight golf courses, numerous resorts and inns, and an adequate offering of restaurants, taverns, cafes, and boutiques.